If you're holding out for the E Class Hybrid that's been in the works for several years, hold on; it should arrive next year. The 2012 Mercedes-Benz E Class models have sharper driving appeal than in the past, while also returning to the classy interior appointments and vault-like construction that have made them longtime luxury benchmarks. Mercedes-Benz's E Class lineup is no longer comprised only of sedans, and maybe a wagon. It's now a full family of models--with four body styles, including Coupe and Convertible models, in addition to scorching E63 AMG Sedan and Wagon models. Among all of these E Class variants is a design presence that's unmistakably German, with more aggressively worked sheetmetal and some crisper cues on the outside, made good with an interior that, for the most part, brings back the fine materials and trims--plus the stout, tight feel--that had previously brought luxury shoppers in droves. 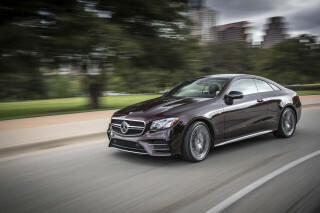 The most popular models in the E Class lineup pack new powertrains under the hood for 2012, while the entire model line otherwise gets a set of relatively minor changes. Base E350 models include a completely new 3.5-liter direct-injection V-6, making 302 horsepower, while E550 models get a new 4.6-liter direct-injection V-8 that makes 402 horsepower. A 210-horsepower, 3.0-liter turbo-diesel V-6 is included in BlueTec models. And at the top of the line, performance-oriented E63 AMG models get a 518-hp, 5.5-liter biturbo V-8 built by in-house tuner AMG. 4Matic all-wheel drive is also optional on much of the Sedan range (E350 and E550 models), and later in model year 2012 it's offered in Coupes for the first time. The base V-6 in the E350 is much-improved in terms of smoothness, and regardless of the model or engine chosen, however, the E-Class range rewards the driver with adjustable suspension settings, a responsive seven-speed automatic, and improved, yet still comfortable, driving dynamics. The E63 AMG kicks the whole show up a notch, with 518 horsepower from its 6.3-liter V-8 engine, and reworked AMG-tuned suspension. Interior space was improved with the latest E Class redesign, a couple of years ago, with better back-seat space than before. Wagon models have even more versatility, with fold-down seats, an open cargo space, and two temporary-duty, rear-facing third-row seats. Wagons also get a new power tailgate. Across the line, build quality is tight, materials selection is mostly excellent, and quietness is a strength. The E Class family offers an impressive number of above-and-beyond active-safety features--many of them optional--to detect driver drowsiness, monitor blind spots, control high beams automatically, maintain a set following distance, and help keep you in your lane. And two of the body styles have earned Top Safety Pick status from the IIHS. Sedans are offered in Luxury or Sport guise--a matter of appearance and taste, really. Luxury upgrades include voice-controlled navigation; Sirius and HD Radio; rearview camera; heated seats; numerous electronic safety assists; massaging seats; Bluetooth; an upgraded, 610-watt audio system; and much more. Crisp, modern styling, with a nod to tradition, is cohesive over four different body styles. Design-wise, the 2012 Mercedes-Benz E Class offers something for everyone--provided they go in with a luxury-car budget, and the desire to look the part every step of the way. With a total of 15 model variants, among four body styles, the E Class range can fit roles ranging from a performance touring coupe to a rather economical family wagon. So it's all the more surprising that the automaker has managed to design an E Class family in which the same styling cues work--mostly--across all of these body styles. The E Class still radiates Teutonic charm. In the front and rear details, the look is similar to other lines in Mercedes' range, including the S-Class and GLK, while two heavy side creases carve out a not-so-subtle upward swoosh. The current-generation E Class family, which was introduced a couple of model years ago, is a sharp contrast compared to the softer-edged, rounded E Classes of the past. Lots of chrome accents, flares, bulges, and creases catch the eye, though what's beautiful to some may be busy to others. The sedan is the baseline for the E Class, with all the other models sharing its cues, wrapping them in different packages. The Coupe rounds off the rear roofline and shortens the wheelbase; the Wagon lengthens the tail and roof line; and the Cabriolet mimics the Coupe's proportions, but swaps in a retractable soft top. The high-performance E63 AMG is easy to pick out from a distance, thanks to its unique wheels and special lower-body aerodynamic treatment (plus an upgraded interior). It was previously only available in Sedan form, but for the 2012 model year it's also offered as a Wagon. Compared to the previous generation of the E Class, the interior of the current car feels a little more conservative, yet also modernist and less curvaceous than some of the automaker's other efforts. Sharp corners and well-pressed creases inside give the Mercedes-Benz E-Class a more traditionally luxurious look that meshes well with the new exterior. About the only thing that isn't so welcoming is the sea of matte-plastic buttons for audio and climate controls--in addition to the COMAND interface that covers infotainment. All models include wood, metal, and refined plastic trims, which you can further dress up through a long list of customization options. 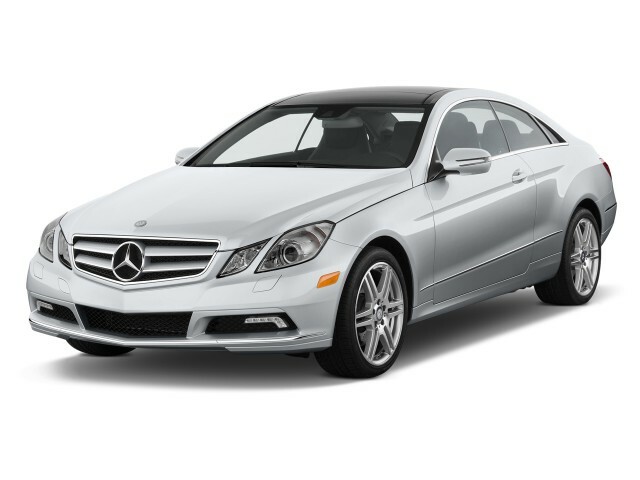 Stronger, smoother, more efficient engines for 2012 match the E Class's quick, composed demeanor. 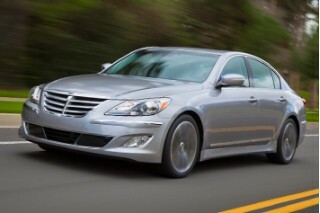 Across the entire family of E Class models there are four engines; and of those, two are all-new for 2012. Base E350 models include a completely new 3.5-liter direct-injection V-6, making 302 horsepower, while E550 models get a new 4.6-liter direct-injection V-8 that makes 402 horsepower. A 210-horsepower, 3.0-liter turbo-diesel V-6 is included in BlueTec models. And at the top of the line, performance-oriented E63 AMG models get a 518-hp, 5.5-liter biturbo V-8 built by in-house tuner AMG. 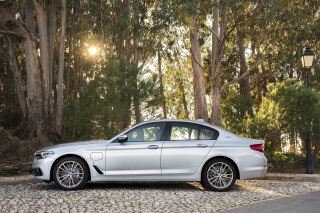 If you want the diesel, it's only offered in the Sedan (in Luxury or Sport guise, though). Both the V-6 and V-8 gasoline engines are available in the Sedan, Coupe, and Convertible, while the Wagon only offers the 3.5-liter V-6, but adds standard 4Matic all-wheel drive. The special E63 AMG is rear-wheel drive only. 4Matic all-wheel drive is also optional on much of the Sedan range (E350 and E550 models), and later in model year 2012 it's offered in Coupes for the first time. At the time of posting, we still hadn't driven any of the E Class sedan models with the all-new V-6 or V-8 engine; but we have driven other Mercedes-Benz models with the V-6, and it's a significant improvement over the previous engine in smoothness, with a strong powerband all the way up to redline and plenty of torque down low. The diesel remains the green choice of the bunch, and one of our editors' picks; it's rated at 24/34 mpg city/highway. All standard E Class variants come standard with a seven-speed automatic transmission, and driver-adjustable suspensions. An air-shock system provides a range of comfort to sport ride quality for the V-8 models, while V-6s use a mechanical valve control to produce a similar range of adjustment. Driving dynamics are controlled and agile for the car's size, though tuning isn't as taut as the sportier end of BMW's or Audi's ranges until you step up to the factory-tuned AMG car. The high-performance E63 AMG gets a special version of the seven-speed automatic transmission that swaps in a wet-plate clutch for the torque converter, but keeps the usual planetary gear arrangement. The result is quicker shifts, more direct engagement with the engine, and higher performance. In style, fit, finish, and cabin ambiance in general, the current-generation Mercedes-Benz E Class models are a return to form. In many respects, the current E Class models are a return to form, to the classy feel and plush interior appointments--combined with vaultlike construction--that made Mercedes-Benz such a longtime luxury benchmark. 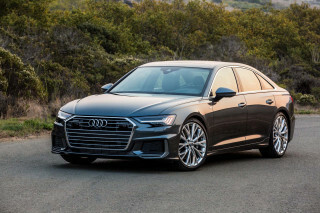 With more interior space and luxury than the previous generation, thanks to a slightly longer and wider platform underpinning all variants, these are quite roomy cars--and especially in Sedan and Wagon forms, a step roomier in feel if not numbers compared to the BMW 5-Series, Audi A6, and Jaguar XF. Back-seat leg and elbow room in particular have improved, though the Coupe and Cabriolet make compromises in the name of style, while the front seats of all models offer plenty of space. By the numbers, the latest E Class Sedans gained significant trunk volume, and the back seat itself is easy to access and flip forward for more space, thanks to a split-folding design. Wagons are of course the most versatile for cargo, and they include a couple of temporary-use, rear-facing third-row seats. Vinyl remains the standard base-level upholstery, though in the U.S., most cars will be sold with leather. Wood trim, improved cup holders, a quieter cabin, and generally improved fit and finish add to the current generation E Class's luxurious feel. Interior appointments are comparable across the entire model line, although the key interface difference between Sedans/Wagons and Coupes/Convertibles is that the Sedans and Wagons get a column-mounted gear selector while Coupes and Convertibles get a center-console-mounted one. Mercedes-Benz significantly improved the trims and finishes in the current E Class models in their last redesign, and they stand up well against any of its luxury rivals. Cabin noise, especially, is perhaps the best in this class. Mercedes-Benz lives up to its reputation in going above and beyond with high-tech active-safety features and options. The E-Class is a rolling showcase of Mercedes-Benz's ability to innovate and pack more safety features than most other automakers. For 2012, there are eleven airbags standard, including driver knee bag, and an optional side airbag for rear-seat passengers can be added. Separate active-safety systems--to detect driver drowsiness, monitor blind spots, control high beams automatically, maintain a set following distance, and help keep you in your lane--are all available, most as part of option packages. The Insurance Institute for Highway Safety (IIHS) has tested both two-door Coupe and four-door Sedan versions of the E-Class, and both achieved top 'good' ratings in all categories, to achieve the Top Safety Pick accolade. The Cabriolet and Wagon weren't tested, but should offer similar protection. Otherwise, the NHTSA (National Highway Traffic Safety Administration) hasn't yet rated the latest E Class. With a long list of features and options, and Sport and Luxury versions, the E Class will please about any luxury shopper. The 2012 Mercedes-Benz E Class lineup includes some class-leading active-safety features, but it doesn't at all forget about traditional luxury-car equipment. Cruise control, interior ambient lighting, dual-zone climate control, a multi-function instrument panel display, and rain-sensing wipers, are all among the base E350's standard equipment. 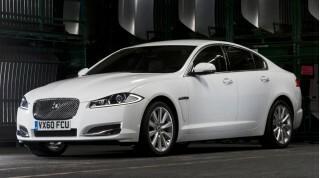 Sedans are offered in either Luxury or Sport guise. Luxury versions feature standard 17-inch wheels; COMAND infotainment and climate control; cruise control; sunroof; power doors, locks, and mirrors; and surprisingly, vinyl seats. Sport versions get larger 18-inch wheels; unique gauges; and stylized exhaust outlets. Optional upgrades include voice-controlled navigation; Sirius and HD Radio; rearview camera; heated seats; numerous electronic safety assists; massaging seats; Bluetooth; an upgraded, 610-watt audio system; and much more. 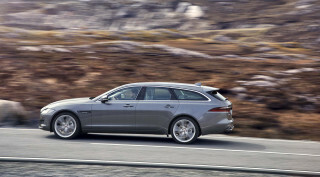 Wagons include a power tailgate and rear air suspension, in addition to the Sedans' equipment--plus, of course, the temporary-duty, rear-facing third-row seat. Two premium packages, a driver assistance package, a sport package, and a wheel package divide up most of these options into convenient groups. Many options can be had a la carte, as well, though it may be tough for those with peculiar tastes to find the exact combo they're looking for on a dealer lot. For 2012, the media interface, for auxiliary input, USB, or iPods, has been relocated to the center console. Stepping up to the $89,775 E63 AMG gets you upgraded materials throughout, plus AMG badges and performance-tuned stability and traction electronics--in addition to a high-performance transmission and the AMG-built 518-hp V-8. Gasoline versions of the 2012 Mercedes-Benz E Class lineup are more fuel-efficient than before, but the BlueTec turbodiesel is still the green pick. Thanks to a new lineup of direct-injection V-6 and V-8 gasoline engines, the 2012 Mercedes-Benz E Class models are significantly more fuel-efficient than last year's models. E350 models now rate up to 20 mpg city, 30 highway, while E550 models get up to 17/27. 4Matic all-wheel drive drops estimates by up to several miles per gallon, depending on the model and the body style. Even considering the improvements in those gasoline engines, you're still going to keep things clean--and the most fuel-efficient--with the E350 BlueTec Sedan. At 21 mpg city and 32 mpg highway, it's the greenest of the E Class bunch. And if you're even reading this section, you probably aren't considering the high-performance E63 AMG models. Rated as low as 15 mpg city, 23 highway, they're guzzlers, albeit very rewarding ones. This is a beautiful car... runs so smooth,that you can't feel the road or wind. Gas consumption is very good even with an 3,500 cc engine. Mercedes Benz build the Finest Cars in the World! This 2012 E350 Sport with 23,400 miles has NEVER given a single problem. 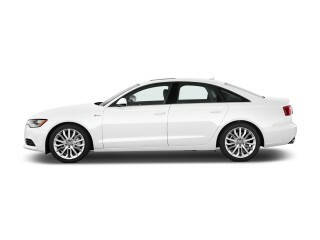 It is fast, extremely Safe, comfortable, and has returned over 37 MPG on trips. I have several other Mercedes Benz's and I can say they... This 2012 E350 Sport with 23,400 miles has NEVER given a single problem. 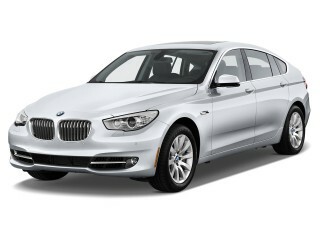 It is fast, extremely Safe, comfortable, and has returned over 37 MPG on trips. My 2012 Mercedes E350 4matic is the perfect blend of elegance and style. The valt like construction give me the feeling that I'll be driving this car for years to come. The wagon version is very versatile yet has the handling of a sedan. Many well-thought-out little aspects make the car very livable and satisfying. We don't like the panoramic roof. The saddle colored seats... The wagon version is very versatile yet has the handling of a sedan. Many well-thought-out little aspects make the car very livable and satisfying. We don't like the panoramic roof. The saddle colored seats with black carpet has grown on us and is very practical.